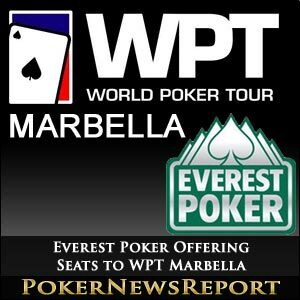 Standout online poker room Everest Poker have once again proven their great value to players of the world’s greatest game by offering seats at the forthcoming World Poker Tour (WPT) Marbella. Everest Poker are certainly kicking off the early months of 2012 in some style through their vast array of fresh promotions, with this latest prize of a WPT seat the highlight so far. The 30th of this month is definitely a date to circle on your calendar as that’s when Everest Poker start running a bewildering series of weekly satellites, as well as sub-qualifiers every day, that will eventually lead to numerous WPT Marbella packages valued at $4,000 being handed out. While finalised details of the Spanish event – the latest addition to the WPT – have still to be announced, Everest Poker’s packages are guaranteed to cover the main event buy-in, as well as hotel accommodation, flights and meals. Everest are, of course, well known for their backing of live tournaments, including the Spanish Poker Tour (SPT), but the poker room was also the only poker-related sponsor of the 2008 and 2009 WSOPs, with the website’s logo plain to see on the felt of every table in the Las Vegas tournament, as well as on banners and barricades. Who’ll Be Crowned King of the Ring? Everest Poker have been running some brilliant promotions recently, including King of the Ring – which sees players square off to score points that ultimately leads to the top 10 winning prizes from the $5,000 weekly pot. The overall tournament leaderboard winner will also be crowned Everest Poker champion and King of the Ring, while the genuine Everest Poker title belt they’ll also receive will be something to treasure forever. It’s all pretty straightforward when entering the event. There are also numerous $2 undercard satellites that can lead to a place in the main event. Next up is The Daily Grand, when players are handed 30 chances – after their first deposit – over 30 days to win the $1,000 freeroll that will begin once they have signed up. Players just have to redeem their Super eTickets to enter the daily freerolls. If all that isn’t enough, maybe the pull of The Big Prime will attract you. The biggest tournament at Everest, there are numerous ways to qualify for every Sunday’s start through the same day’s 40-plus satellites from $1, sit and go step events from just $2, and via the another of the site’s promotions, The Winning 50. 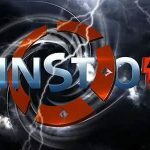 The Big Prime has only recently got even better for players, too, with the event guaranteeing a minimum of $75,000 in prizes – and where you might come up against one of the site’s three Team Everest Pros in Frenchman Fabrice ‘FabSoul’ Soulier, Portugal’s Catarina ‘katrinapt’ Santos and Hungarian wildcard Peter ‘majesz187’ Majoros. 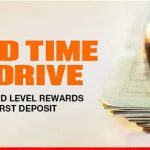 As is to be expected with such an innovative poker room, Everest Poker also offer out-of-the-ordinary prizes, including the $1 Vacation Tournaments, which can see successful players jetting off to almost anywhere on the globe.The $1 Vacation Tournaments run every day, with cash finishers being handed a $200 eTicket and $15 in cash. 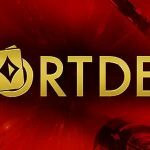 Thereafter, you can choose which event you fancy and directly enter – and maybe look forward to rubbing shoulders with some of the biggest names in poker at a lavish hotel and casino. Moreover, there are several other promotions to look out for, including $10 for $10. 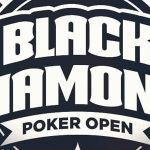 New customers can pick up 10 $1 eTickets when depositing at least $10 and they will then have the opportunity to enter 10 $1 buy-in events, such as the $1 Vacation, the Chip and a Chair tournaments or even one of Everest’s $1 Daily Satellites. Of course, the usual schedule of tournaments might be just as attractive to newcomers to Everest Poker, but don’t forget to check out every one of the poker room’s promotions…you might just be starting on the path to glory. Maybe you’ll even follow in the footsteps of 27-year-old Antoine Saout, who picked up $3,479,670 for finishing in third place at the 2009 World Series of Poker main event after the Frenchman qualified through an Everest Poker satellite.